TAMPA, Fla. (December 5, 2013) – Halo, Purely for Pets, Ellen DeGeneres’ natural pet food company, today announced it has become the exclusive pet food sponsor of AdoptAShelter.com, a shopping portal allowing consumers to donate to their favorite animal shelters at no cost to themselves – just by shopping at stores such as Amazon®, Petco, Best Buy, iTunes, Expedia, Lowes, and more. AdoptAShelter.com is an online Cash Rewards Mall featuring over 500 top-name merchants, from Amazon to Zazzle®. With no login or password needed, shoppers simply connect to their favorite online stores through AdoptAShelter.com, select their favorite shelter to receive a percentage of their shopping totals, and then shop as they normally would. Halo donates over 1.5 million meals of its Halo Spot’s Stew every year to shelter pets by sponsoring Freekibble.com. 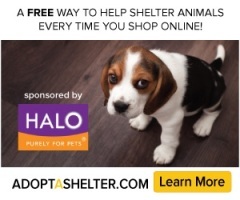 Halo also sponsors the PBS series “Shelter Me,” and donates more than five times the national corporate average through the Halo Pet Foundation, which sponsors national adoption campaigns with the Humane Society of the United States, ASPCA and more. Pet parents can also shop for Halo natural pet products on AdoptAShelter.com through Petco.com, Amazon.com, Wag.com, Pet360.com (Pet Food Direct), Drugstore.com, OnlyNaturalPet.com and 1800PetMeds.com. For over 25 years, Halo, Purely for Pets® has created holistic pet products of uncompromising quality. Halo believes nutrition is the single most important factor in the quality of a pet’s life. Halo offers natural pet food, treats, supplements and grooming products – including the award-winning Halo Spot’s Stew, Dream Coat and Liv-a-Littles treats. Ellen DeGeneres – a long time Halo customer – became a part-owner of Halo in 2008. Halo’s’s natural dog food, natural cat food, treats, supplements and grooming products are available at Petco, Whole Foods Market, your local pet specialty and natural food store, and online at www.halopets.com. AdoptAShelter.com® is an online community where animal lovers can shop at hundreds of well-known merchants and service-providers while turning everyday purchases into contributions that directly benefit their chosen animal shelters, humane organizations or rescue and adoption groups. Every time you shop using AdoptAShelter.com, you earn money for your favorite animal charity. 100% of the donation displayed on AdoptAShelter.com goes to your shelter/organization. For more information, please visit www.adoptashelter.com.